Holton is located in Northeast Kansas among rolling hills dotted with small farms and wooded areas about 28 miles north of Topeka, the State Capitol. 4 lane U.S. 75 Highway, links Holton to Topeka and is the gateway to major metropolitan areas in the Heartland. 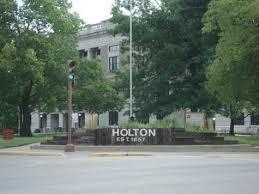 Holton is the county seat of Jackson County with the courthouse serving as the center of the square vintage downtown business district. Today, Holton is a classic midwestern community boasting turn of the century homes with large porches and hand carved trim. Brick streets lined with stately old trees frame a network of neighborhoods within this city of 3,300. The surrounding area of Jackson County has a population of 14,500. The recreation options available are ample. Banner Creek Reservoir is approximately 1,500 acres used for fishing, boating, skiing, camping and hiking trails. People in the county also enjoy golfing, hunting, countless sporting activities and shopping. The bustling Jackson County seat is one of the state's most dynamic rural business centers. Holton has earned the #2 ranking in retail trade activity among Kansas' smaller rural communities earning the nickname of dynamo of statewide community business. Jackson County is proud to have three dynamic school systems. Holton Schools, USD 336, is a class 4A school located in Holton. Jackson Heights, USD 335, is a class 2A school located just four miles north of Holton serving four rural towns in north Jackson County. Royal Valley, USD 337, is a class 3A school located in Hoyt. All of our schools pride themselves in the exceptional learning environment they provide each student.